WPTI is grateful for the generous and encouraging support of the Pinkerton Foundation for our 2018 Foster Care Roundtable Series. The Roundtables are hosted four times a year, strategically bringing together senior leaders and middle management from the foster care and the workforce development fields to respond to the contextual, programmatic, and organizational issues that leaders face in preparing and connecting foster care youth to quality internships and employment. 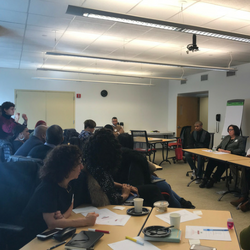 Each topic created the space to further explore gaps between the fields and build upon the community by providing tools, strategies and ongoing support to prepare youth transitioning out of the NYC foster care system into the NYC workforce system. The only way in identifying those gaps was by inviting the experts themselves to speak on a panel and have small group discussions, which resulted in rich reflections and takeaways. The Youth Perspectives on Foster Care and Workforce Readiness session included guest speakers who are former and current foster care youth alongside practitioners who have supported them through their work-readiness preparation and still provide services when needed. Each guest speaker brought to the forefront their experience and suggested ways to collaborate with youth entering and exiting the foster care system. One panelist, a former foster care youth through the Los Angeles foster care system and a recent graduate with an MA in Philosophy, spoke about ways to strengthen the system and better equip youth entering the workforce. Another panelist emphasized that it is up to the youth themselves to find the motivation to continue seeking services and wanting to improve their lives in alignment with the provider agencies and practitioners who are willing to assist through the process. During the Retail & Food Service and Construction & Manufacturing sessions, practitioners were able to learn more about labor market information and the NYC Labor Market Information Service. Leaders in the field obtained knowledge about current labor market intelligence and ways to better utilize labor market conditions and opportunities strategically within their programs for their participants. The panels from these two sessions featured employers and training program representatives who discussed what is currently happening throughout the NYC workforce system. Employer representatives spoke about their hiring practices, what they really look for when interviewing potential candidates and ways they assist their staff in growing professionally. 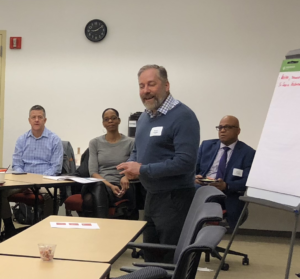 Training program representatives spoke to the services they offer, and further discussed the ways they collaborate with other provider agencies to assist NYC residents and foster care youth struggling with navigating such a complex system. The final session was a Foster Care Roundtable World Café where providers shared their challenges, triumphs, best practices, resources, lessons learned, and questions. This solidified the trends and connections between the Foster Care and Workforce Development system. This forum brought to light the similarities in navigating the foster care and workforce development system in New York City. We are happy to share that we will host again the Foster Care Roundtable Series, please stay tuned for announcements of the schedule. We especially thank Laurie Dien and the Pinkerton Foundation and Raymond Singleton and Raymond Toomer of the NYC Administration for Children’s Services for their ongoing partnership and support. Patrick Persons, Butter Beans, Inc.